So true about the cutting board! 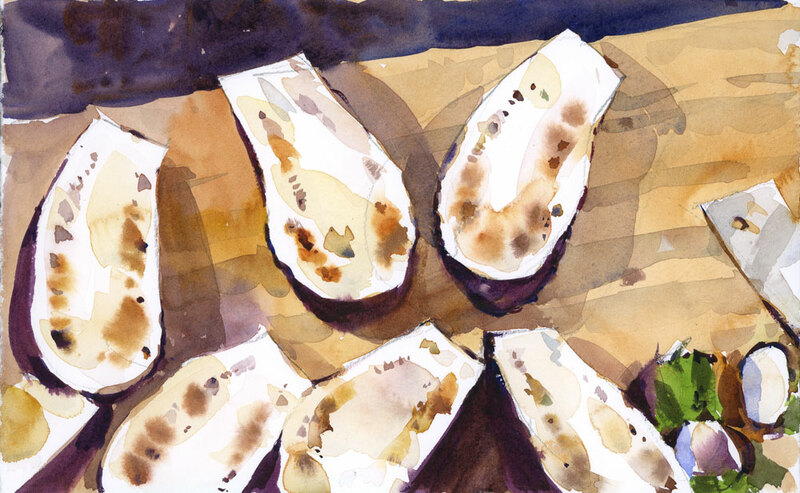 Shari, your eggplant slices ARE as wonderful as you beautiful Asian sketches. They are full of life and color and are very exciting to look at. I love the Asian sketches you have posted so far, but these inspire me to enjoy the everyday things, I might overlook. Thanks so much for this particular post ! I’m so glad you liked it Nessa. Yes, the everyday can be as wonderful as the exotic. Thanks for the cheeky suggestions. I often look at those painting challenges but I always figure that after a few days I would want to do something else. Have you tried them? Haha anytime! Frankly, I have done a few in the past, but nothing too recent (although I want to start a 30 day drawing challenge in the near future). Maybe you’d be interested in one-time challenges, such as the old/new “improvement” challenge, where artists take a very old painting/drawing, and re-create it to see their improvement. Let me know what you think! Beautiful drawing of every day things. Very inspiring post – thank you. I, too, need to draw every day, otherwise I seem to feel like a beginner all over again. Weird, isn’t it?! It’s weird but true. Daily practice is essential or I feel like a beginner too. You made the mundane a work of art. Your posts are always inspiring. Thank you! This is just what I needed today. I always love your comments George. Quotes from musicians are much appreciated. It amazes me what you can do with a little light, color, and tone variation. You forgot to include eggplant and salt. Thanks for this post. It was an excellent message. I loved the eggplants. Shari you are my inspiration! Beautiful!!! Glad you like them Becka. Mundane is relative… to me everyday life in Montreal seems exotic… you have snow! Don’t remind me! I am enjoying the heat wave we are having now. This post is spot on! When I don’t draw at least a little every day I can see the difference and feel the rust forming not only on my skills but also on my disposition! Sketches of what might be considered mundane bring into focus the elegance of simplicity. It is always there. Truth is simple and a simple truth is always the most profound. I have read many times about the importance of drawing and sketching what is front of us. It helps to establish the habit of observing, of building momentum, of improving our skills, and of developing a vocabulary of forms. Your post serves as a reminder of sketching as a daily practice and living in the moment through what is in front of us. Thank you. I will start today; I always feel like a beginner and often let that overpower picking up my sketchbook. Love the eggplants. There is so much to see in your sketch, Shari. Well said Louise. Thanks for taking the time to write. It ‘so valuable to know how to show in humble things of everyday life their beauty hidden. And you, like a true artist, you know do well! It is useful your post and I’m trying to do as you indicate: a small drawing per day, refining my ability to see and reveal the soul of things. I have a lot to learn technically, no matter if I mess with pen and ink or color brushed not good, I learn by practicing in the meantime, and while I honed my watch. The beautiful long eggplants: how did you cook? fries? grilled besides dipped in olive oil, garlic and parsley and a bit of mint? or with tomato and … see, your painting has stimulated my culinary creativity and I feel the aromas and flavors possible and feel soft when I imagine to put in my mouth … wonderful, It ‘life you posters! Thanks for writing Luisella. These little eggplants were salted and then went into a dish called “Imam Bayildi”, Turkish in origin, stuffed with onions, garlic and tomatoes and then baked. Very delicious. Very inspirational blog. Thanks, Shari! Very good advice Shari! I love what you did with the eggplant! This isn’t mundane at all. Just beautiful!! Eggplant is also exotic! Maybe not like the River Kwai, but look at the shape, color and texture of that eggplant. Anything that grows from a seed into a beautifully shaped creation is a miracle! The inside of a bell pepper is the same. All of nature is a wonderment, even if it’s all around us every day. I love this painting/sketch as much as the River Kwai one. If I don’t draw every day I land in the same place Stella does (poster above) rust sets in, stiff sketches appear, very non spontaneous, I’ve not painted or sketched for several weeks do to an very unexpected health issue, it’s not allowing time for anything but tests, waiting, more tests. & will continue for some time. So I have to content myself with looking at others sketches, yours being my favorite place to visit. I so agree with your words of advice and hope to pick up my pen soon. Joan, I agree about the miracle of fruits and vegetables. I think about that every time I bite into a peach or cut open a ripe tomato. I am sorry to hear about this health issue though. I hope that everything gets resolved quickly, and that you return to good health (and your sketchbook) soon. Best wishes!